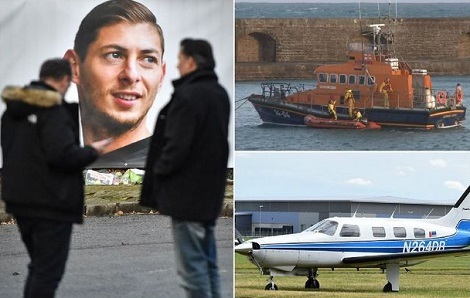 Crash investigators have found two seat cushions which they believe are from the plane which was carrying Cardiff City footballer Emiliano Sala when it disappeared over the English Channel. The two seat cushions washed up on the same area of coastline, near the Normandy town of Surtainville, around 30 miles from the plane's last location. The Argentinian striker's family are currently in Europe after raising funds to launch their own, private, search for the wreckage of the plane. They will be hoping the latest discovery could be the first step towards finding out what happened to the 28-year-old player and the pilot flying him from Nantes in France. On Monday, the footballer's mother Mercedes and sister Romina flew over the area where Sala's plane was last located. The Air Accidents Investigation Branch (AAIB) said today: 'On the morning of Monday 28 January, we were advised by the the French safety investigation authority that part of a seat cushion had been found on a beach near Surtainville on the Cotentin Peninsula. 'A second cushion was found in the same area later that day. From a preliminary examination we have concluded that it is likely that the cushions are from the missing aircraft.